HO CHI MINH CITY- With average per capital annual incomes of just over US$1,000, Vietnam is officially a lower-middle income country, and in Hanoi, the seat of government, and commercial capital Ho Chi Minh City – still popularly known as Saigon – property prices are on an upward curve and new building and property developments appear shoot up faster than new growth in Vietnam’s lush tropical rainforests. The appearance is somewhat illusory. The country faces crushing inflation, forecast by Standard Chartered Bank at 19.7 percent in December, with an 11.3 percent rise forecast for 2012. The dong is expected to continue to depreciate throughout the year, given Vietnam’s US$8 billion current account deficit and low foreign currency reserves. With the State Bank of Vietnam attempting to sop up liquidity, tight monetary policy is starting to put pressure on the banking sector, with the result that some small banks have raised interest rates as high as 18 percent annually despite a central bank request to keep rates at 14 percent. That is placing considerable pressure on investment although loan rates have fallen considerably from their 2011 levels, which averaged 22-27 percent, according to the World Bank. In particular the high interest rates, rising inflation and property oversupply have turned the boom to a bust and the urban areas are suffering from the hangover. In addition to curbing lending through monetary tightening, the government has categorized some property as high risk for commercial banks, making it difficult for state banks to extend loans for new projects. According to Marketresearch.com. developers are now seeking joint venture partners for financing because of the scarcity of bank loans. Nonetheless, there is a sense of a country on the up, with continuing government announcements of overseas investments, new brand-name shop fronts and luxury cars cruising amid the endless din of tens of thousands of motorbikes careering along the streets of Hanoi and Saigon. Asean estimates suggest that Vietnam and Indonesia are the top two destinations for foreign direct investment in Southeast Asia, with FDI inflows for Indonesia, Vietnam and Singapore increasing by 174 percent, 140 percent and 120 percent, respectively over 2011. Vietnam’s doi moi policy, or economic ‘opening-up’, has reduced poverty from 75 percent in the mid-1980s to 14.5 percent in 2008. Per capita income averaged around US$400 in 2000. Their doubling in a decade is the result of 7 percent annual per annum average economic growth. GDP growth was 6.5 percent in 2011, expected by the World Bank to fall to 5.5 percent in 2012. 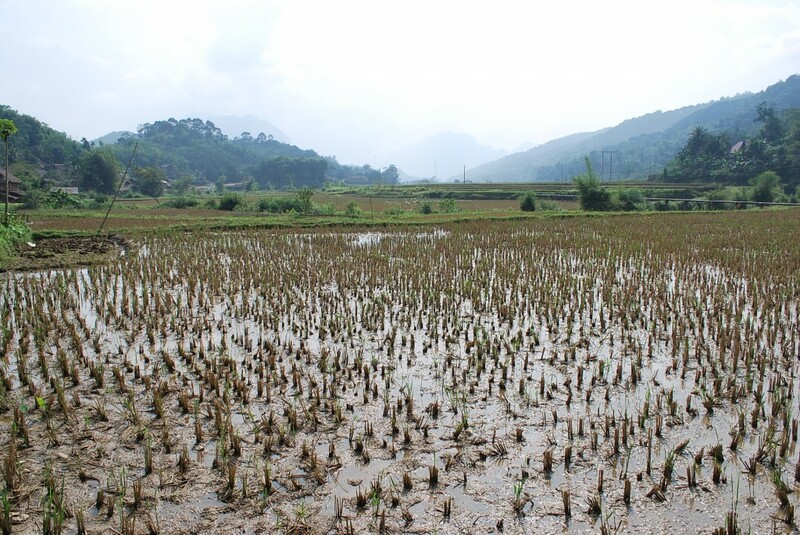 Vietnam still has areas of raw poverty, particularly in rural areas where many the country’s 53 ethnic minorities live. More than 80 percent of the population are Kinh, speaking Vietnamese, while the rest is made up of groups such as Khmer Krom and Hmong. A decade of robust growth has generated an urgent need for efficient transportation networks and modern infrastructure of all kinds from electricity to transport, which has spurred the government to release US$7 billion for highway, rail and other transport infrastructure over the next two years through the end of 2014. Nobody knows that better than Lu Van Thinh, an ethnic Thai bamboo farmer in Ngheo village, a three-hour drive from Hanoi through stunning karst mountain landscapes reminiscent of an inland Halong Bay, and along the old Ho Chi Minh trail. 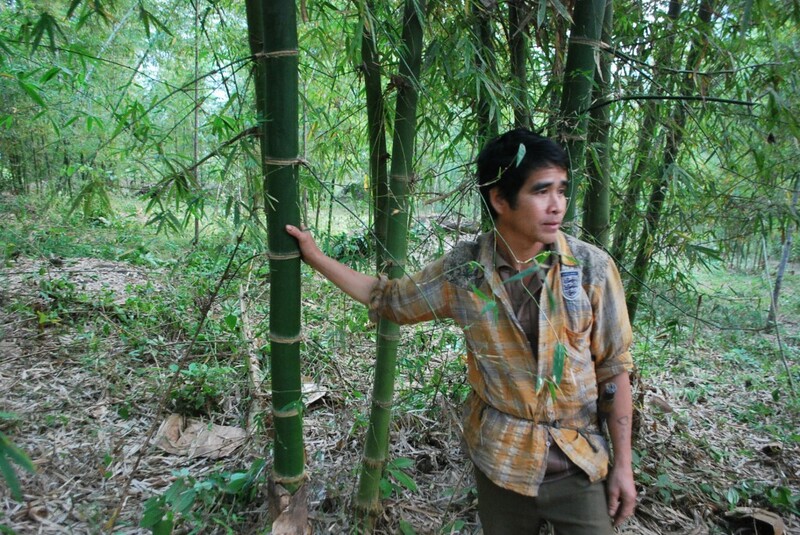 He has about 1,000 bamboo plants on his farm, but said that poor roads and lack of cash to purchase a truck limit his options to expand the business. Over plates of fried chicken and noodles, washed down by eye-glazing toasts of rice wine, Ngheo residents said that the house-on-stilts dwellings were lit by power supplied by locally-made and installed water wheels. The village of Ngheo, the name of which translates as “poor” in English (another village 5 miles away is called “Difficult”), lacks streetlights and is not yet connected to the national grid. This kind of rural poverty is the ‘push’ to match the ‘pull’ of urban growth and job prospects in Hanoi and Saigon. The Vietnamese government estimated in 2009 that there were 7 million migrants in Saigon and 26 million across the country — huge numbers in a country of 90 million people. As with most other Asian countries, the total fertility rate has been dropping sharply — from more than 2.5 live births per woman in 2000, to 1.9 today –- below the 2.1 rate to maintain equilibrium. But with 25 percent of the population under the age of 14, the absolute number will continue to rise until those in the early baby boom generation age past their reproductive cycles. In the endless industrial park suburbs ringing Saigon, a vast city of 12 to 14 million people that spills out into neighboring provinces, around 65 percent of the population are migrants. People on the move offer investors a low-cost and flexible labor supply, but sometimes this is not without trouble. “We tend to lose around 20 percent of our staff every year after Tet,” the Vietnamese New Year, said Kim Jung Hee, a factory manager in Binh Duong province, an hour’s drive from Saigon’s centre. Kim’s Korean company, NB Blue, employs 1,000 workers in a clean and well-lit factory churning out hoodies and tee-shirts for well-known brand names. Kim said that she is ready for anticipated staffing losses when her factory -– like most others in Vietnam –- shuts for a week or more around the January 23 holiday. Seven weeks out, domestic flights and trains are already running close to booked-up, and Kim conceded that most her staff will head north for the break, some never to return. “They go back to their villages, and they hear about new jobs elsewhere so follow those rumors,” she said. 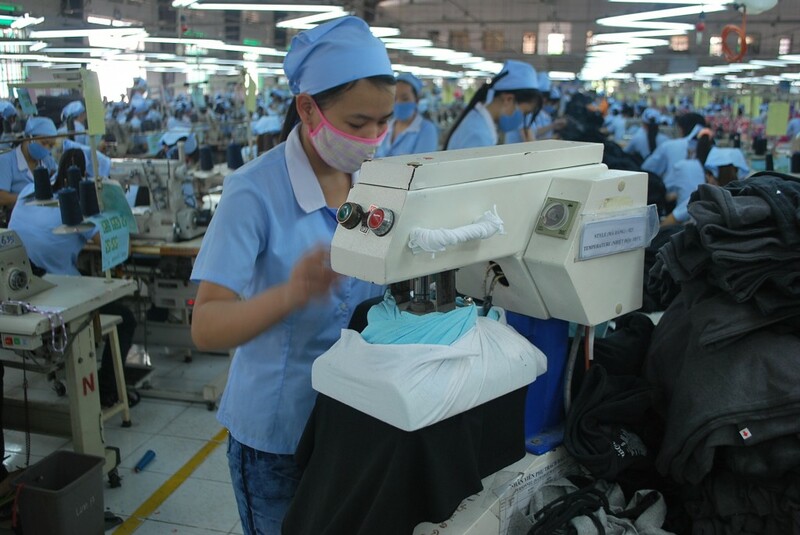 NB Blue has signed up to Better Work Vietnam, an initiative backed by the International Labor Organization and the International Finance Corporation which aims to clean up the country’s sweatshops. Kim Jung Hee said she is happy with this: otherwise NB Blue would lose its lucrative contracts with the likes of Gap, which has also subscribed to the Better Work project. The mostly young, female, rural-origin workers earn an average of US$120 per month, in keeping with Vietnam’s minimum wage requirements. One of the few men in the factory, Nguyen Van Vu, 28, migrated to Saigon almost 10 years ago, and after numerous job changes, is now head of the ironing section. He said his salary has risen three times this year and added that “in general working in this factory is good”. However raises are being eaten up by Vietnam’s stubborn inflation, which could send some of the new “middle income” Vietnamese back into poverty if it continues. Food prices have doubled over the past year, meaning that in Vietnam, as in many other poorer countries where people spend a high proportion of their income on food, low-wage workers are struggling to make ends meet. Vu remits some of his earnings to his parents, who live on a farm in Quang Tri province, not far from the old Vietnamese imperial capital of Hue. He recently got married, and his wife is seven months pregnant. All told, even with the salary hikes, he is feeling the squeeze, as are those dependent on his earning power. On top of everything else, Vu’s meager yet locally-competitive salary helps fund his sister’s studies in Danang, Vietnam’s fifth-biggest city. Danang is former US marine airbase during the Indochina wars and sits about halfway between Hanoi and Saigon on Vietnam’s 2140 mile coastline. “Without my wages, she will have to quit,” Vu lamented. Last week, Ireland’s Minister of State for Trade and Development Jan O’Sullivan visited Vietnam, to see how Irish aid has contributed to growth and to launch a new five year programme costing 11 million euro a year. The Minister said that Vietnam’s story shows that development assistance works, and that a rising Vietnam can offer commercial opportunities for Irish businesses seeking a low-cost foothold in the Asia-Pacific. “Ireland’s development work has created good will towards us in Vietnam”, she said. Cork-based software developer Glandore Systems has made the move. Its Saigon-office is managed by James Galvin. He said he can achieve greater flexibility with lower costs in Vietnam, compared with Ireland.